Home / Tips & Advice / Why Custom Cabinets? 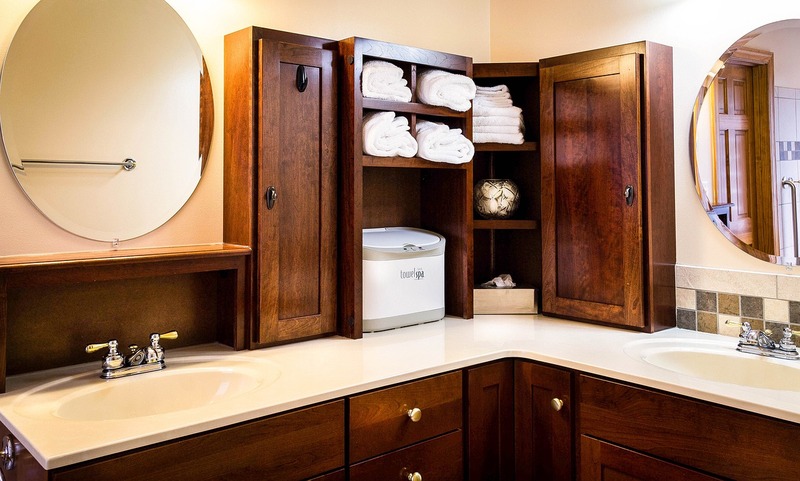 If you’ve ever wondered about the benefits of getting custom cabinets for your kitchen, bathroom or laundry, then this post is for you. We outline some of the main reasons why you might consider custom cabinetry for your home. Stock cabinetry is designed for stock spaces. It is the “lowest common denominator” in terms of a design which can be used by the most number of people. If you have an unusual kitchen layout or an unconventional bathroom floor plan, stock cabinets won’t fit your dimensions snugly and you’ll be forced to use fillers in these areas. They also don’t cater to personal preference so you can end up with finishes and colours that you like but don’t really love. Custom cabinets, on the other hand, are designed and built to fit the exact dimensions of your space and lifestyle, and take into account your personal preferences for style and colour. Your space will be carefully measured and cabinetry designed to make the best use of it, even if it’s an unusual size or oddly shaped. Custom cabinets give a fitted look to your kitchen, bathroom or laundry, particularly if you have an older home with dated dimensions, and can be crafted to include unique design elements. ‘Out of the box’ cabinetry may offer lots of combinations for colours and designs but trying to achieve an exact colour match with existing paintwork is more difficult. With custom cabinetry you can achieve a perfectly streamlined kitchen, bathroom or laundry because custom cabinet companies offer superior finishing techniques with unlimited capabilities for custom colour matches. Stock cabinets from a chain store may be a bit cheaper, but they won’t give you long term value like cabinets that are custom made. This kind of cabinetry is typically mass produced on an assembly line. You’ll end up paying more by having to redo your kitchen or bathroom because like all mass produced stuff, it falls apart. Custom cabinetry is constructed by hand and by skilled cabinet makers. They use quality materials that are durable and strong and construction methods that are built to last. Choosing to install custom cabinets generally means you get to hand select the wood used to make your cabinets and check for consistency in both grain pattern and colour. With custom cabinetry you also have a much broader choice of wood for your cabinets, including local or domestic hardwoods. Shopping local is good for the environment as it means a smaller carbon footprint and is great for the economy. Shopping local also means you’ll get to know the people doing the work for you, and they’ll get a personal understanding of your space and your needs. If you’re wanting to add value to your home, custom cabinetry for the kitchen or bathroom is one of the best ways to go about it. Kitchens and bathrooms are the two rooms that give you the best return on investment. Not only is custom cabinetry a great value add for your home, a well designed and built kitchen also increases your home’s aesthetic and design appeal. On the face it, many people believe custom cabinetry to be way more expensive than stock cabinetry, but you may be surprised that it doesn’t always come with a hefty price tag. In terms of finish, construction and space utilisation it can be well worth spending a little extra money for a superior product, especially if you’re looking to add value to your home. Cabinets are the focal point of your kitchen, bathroom or laundry, and a reflection of your personality. So you should get it right and spend once with custom cabinetry, rather than having to spend twice by having to get it redone. Or worse, live with poor design decisions for years. At Exact Cabinet Makers we design and build custom kitchens, bathrooms and laundries in Melbourne. You can choose from a huge range of materials and hardware to customise your cabinets just the way YOU want them including, soft action doors and smooth glide drawers and lifts to make access a breeze. Want more drawers and cupboards? Higher or lower cabinets to fit a specific item? We offer great design flexibility and size variation and our qualified and highly experienced cabinet makers can deliver to any standard and any budget. Contact us to discuss your custom cabinetry requirements or kitchen designs Melbourne.